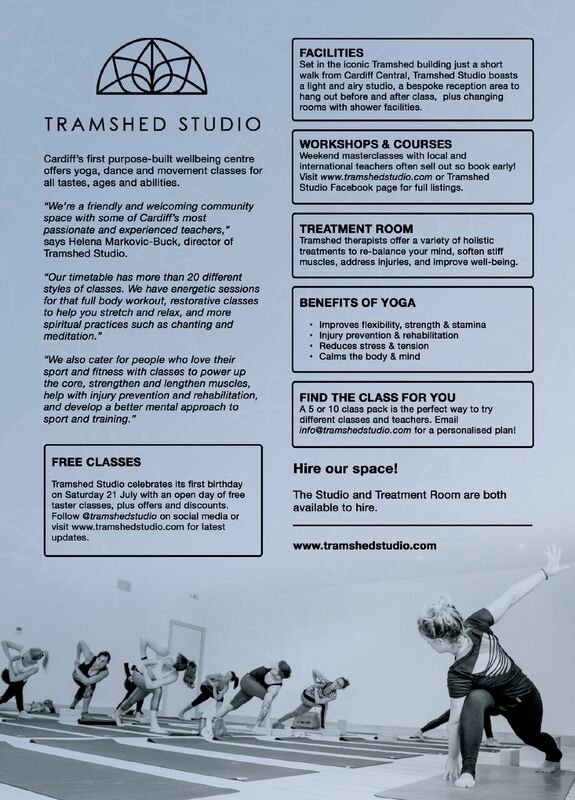 As Cardiff’s first purpose-built wellbeing space, Tramshed Studio offers yoga, dance and movement classes seven days a week in a range of styles to suit all tastes, ages and abilities. “We’re a friendly and welcoming space for the whole community with some of Cardiff’s most passionate and knowledgable teachers,” says Helena Markovic-Buck, director of Tramshed Studio. Set within the iconic Tramshed building and just a short walk from Cardiff Central train station, Tramshed Studio boasts a beautiful light and airy studio space, a stunning bespoke reception and seating area – perfect for hanging out and chatting to your new friends after class – and male and female changing areas with toilet and shower facilities. There’s also Tramshed Studio’s treatment room with a variety of holistic treatments to help you feel relaxed, re-aligned and re-energised. The team of therapists will re-balance your mind, soften stiff muscles, address any injuries, and improve your well-being. Tramshed Studio is celebrating its first birthday on Saturday 21 July with an open day of free taster classes as well as special offers, discounts and promotions. Full details will be announced on the website and Tramshed Studio social media channels. Follow @tramshedstudio for the latest updates. Yoga for your body, mind and soul! Why not take advantage of the class pack offers and try a few to find the class and teacher that resonates with you. Some of the classes include Power Yoga, Kundalini Yoga, Vinyasa Flow, Pilates Stretch, Yin Yoga, Hatha Yoga, Iyengar Yoga, Pregnancy Yoga and Mum & Baby Yoga. And coming soon…Kids and Teen Yoga and Dance! Check out the website for the timetable, pricing and a detailed description of each class. You can also email info@tramshedstudio.com and Team Tramshed can help find the right class for you.